Located near the Nadi airport and offering free airport pick up, this hostel was a great stopping point after arriving in Nadi. When we first arrived at the airport we were anxiously looking around for our ride. After several minutes of not seeing anyone and apparently looking quite lost, an airport aide asked us if we needed help. We told her that we were waiting for our ride from Bamboo and she just smiled and shouted “Hey Bamboo, your passengers are here!” Up jumped a young man from the food court with two other passengers (Yes, Nadi has a pretty small airport!). We had arrived late and it seemed he was entertaining the other guests while they were waiting for us! It was a pretty quick drive to the hostel being only 11km (about 7 miles) to the hostel from the airport. 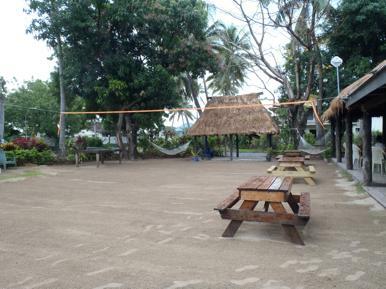 The first thing you see when you pull up is a great sand volleyball court and a nice area to sit outside with the attached food service building. You can’t really say restaurant, but it comes close. Samu and Henry enthusiastically greeted us and they, like everyone else here, would recall our names for the two nights of our stay. We were told that people in Fiji will always remember your name and they proved it right off. Bamboo has a nice range of accommodations from dorm rooms with bunk beds to private double bed ensuite rooms. The location is near a beach but not the beach you would have imagined in Fiji. This one was nice for walking on and had a few horses you could ride for a couple of dollars, but there was no blue waters and powder white sand. That would have to wait for the Yasawa Islands! In the afternoon the boys who worked at Bamboo, along with any guests who wanted to, always played a very competitive game of volleyball. It was fun to watch them while enjoying a nice cold beer from the bar area. Overall a fun place to be! 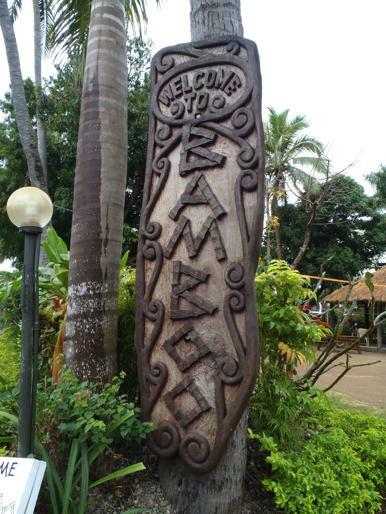 The Bamboo Hostel is located in an area where several other hostels are as well. This was nice because we used the amenities at Smugglers Cover (great laundry and restaurant with a fire show some nights!) Mornings here were pretty active as most people used this area and these hostels as a jumping off place to explore the rest of Fiji. In the morning the Awesome Fiji Adventure bus as well as the bus to Suva often picks up passengers at around 7:00 or 7:30. Our room was a double ensuite – one double bed with an in room bathroom including a very small shower. There was not much more to the room, but you did not really need more. One thing to note here is that the hostel was very clean and bug free. Many, if not most of the hostels we stayed in around Fiji had these small ants that seemingly are all over the island and close to impossible to control. Bamboo had no issue there at all! The cost per night was $60 FJD or about $30USD for our double room. 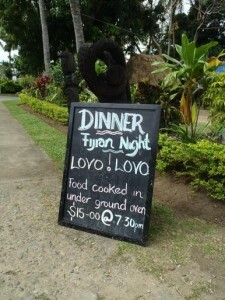 $30 US for a double room in Fiji? Geez, that’s amazing. Didn’t realize you could travel around Fiji so cheaply. Will have to look into this as a future overseas trip then!